I have been using Goex FFG and Goex Cartridge in both a Sharps 45-70 reproduction rifle and a third generation Colt SAA .45. I have had no problems with either of these two powders. Recently, I acquired some Swiss 1 1/2 FG for use in the Sharps and was considering loading some .45 Colt with it. Does anyone have any experience with Swiss 1 1/2 in a .45 Colt? Most information I find indicates FFFG for .45 handgun. Any information would be appreciated. Last edited by StevenT; 04-12-2019 at 02:19 PM. I suspect you would find a lot of unburned powder with 1 1/2 FG in a .45 Colt. It might be OK in the Sharps. Wont hurt anything to try it. OK, I think I will try it. It may be several days but I will let you know how it works. The heavier the Bullet, the less poorly the 1.5 F will work in a Revolver. Coarser Granulations take longer to Burn...the heavier the Bullet, the more ( albeit, micro-time ) time they have to burn. I use both Swiss and Old Eynesford 1.5 & 2 F in both 44-40 WCF and 45 Colt handgun and rifle. 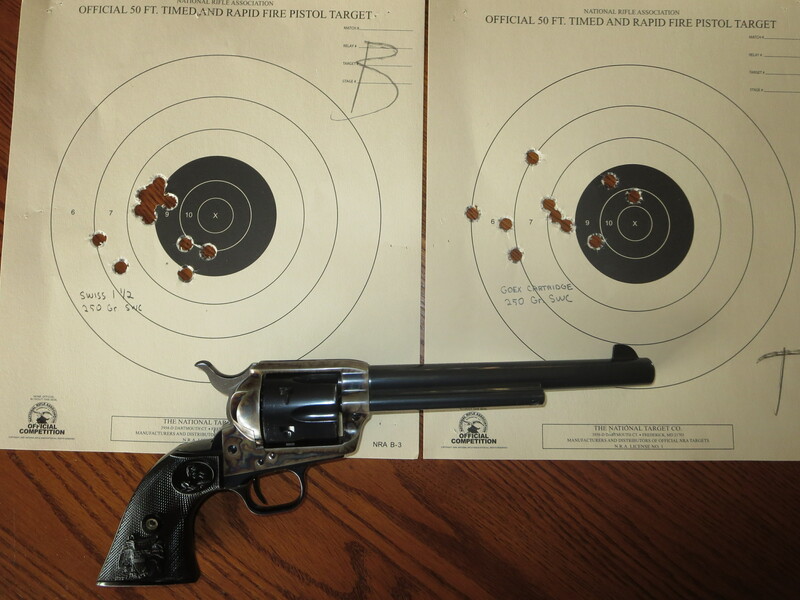 Light loads will leave unburned powder and bind up a revolver quickly.By getting near top end B/P 35+ grs. of B/P 230 gr. soft cast bullet,good B/P lube in the 44-40 WCF will burn as clean as any smokeless load leaving minimal fouling. Same for the 45 Colt, B/P is not a forgiving powder with respect to light loads.Most people do not want to shoot 'as designed' loads in their handguns in particular with black powder. 'Lighter load' with B/P is a lighter bullet with more powder, always maintaining more compression than you might think to get a clean burn.Filling up some space in the case with wads and what not does nothing for fouling control it only increase's the fouling.Rifle cartidges are more forgiving with no cylinder gap to over come. Any of the single big lube groove soft cast bullets suitable for the gun,i.e. right size filled up with a good B/P lube like SPG is very rewarding and not a big pain with fouled out guns. To the O.P. After more than 15 yrs. using Swiss powders in many different handgun and rifle cartridges it always proved superior to Goex,fouling,velocity,consistency. I finally ordered up a bunch of Goex Old Eynseford in 1.5 & 2F and used it first in my 40-70 SS with excellent accuracy softer fouling and better velocities,this has been true for 45 Colt's and 44-40 WCF's as well. It is about $5.00 a pound cheaper than Swiss. Every once in a while I'll load some Swiss and chronograph with my LabRadar to keep them both honest. The O.E. 1.5F is chunky but no problems with it bridging funnels or drop tubes. Last edited by longranger; 04-11-2019 at 08:54 AM. phyllis1 and StevenT like this. Well, it was a little breezy here in the Texas panhandle but I went to the range today with two different BP loads to test. The weather is supposed to be worse tomorrow and I didn't want to wait for an ideal day. I loaded twenty rounds of .45 Colt with Swiss 1 1/2 FG and twenty with Goex Cartridge. The weighed amount was 34 grains of black powder but I used a Lyman powder measure and, once I had it adjusted, I did not weigh any individual charges. The bullets were cast from a Lyman mold using a 20:1 mix of lead and tin and weighed 250 grains. The primers were standard large pistol. There was a small amount of compression of the powder (about 1/16"). I used a seated position with one elbow on the bench shooting at a distance of 15 yards. It felt fairly stable but the wind was coming in from the 4 o'clock position and I know that I cracked off a few shots when I should have waited for the wind to settle. I shot a ten shot group with each powder then took a break and shot another 10 round group with each powder. The wind picked up a little between sessions. The felt recoil from the Swiss powder was a little heavier. It just seemed to be a stouter load. I did notice that the fired cases from the Swiss loads appeared to be a little dirtier. I did not notice any unburned powder though. In case you can't see my pencil writing, the Swiss loads are on the left in each picture. 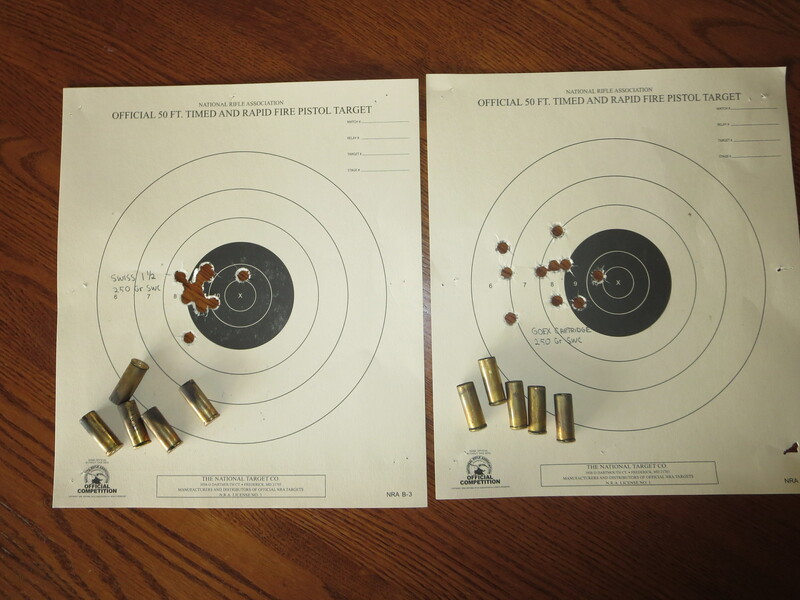 The picture with the Colt is of the targets shot after the break. I hope this is of interest to BP shooters. I know this is not any kind of real test of any brand of BP. I just wanted to shoot some Swiss black powder against a powder I have shot in the past and like. I will have to get back out there when I have better conditions. 29aholic and longranger like this. Thanks for all the information you provided above. I had no idea that Goex was producing a powder called Old Eynseford. I have some FFG and Cartridge that I bought years ago and have not been paying attention to developments in black. I plan on getting some to try now. No reason to 'Stick' with Swiss if Old Eynesford does the same thing for less money and is American made.